2 Charles Thomas SHARMAN but no marriage records found. Sarah Ann Prosser died on September 7th 1895, aged 63 years. She died in the small weatherboard cottage, which was her home at 21 Barnett St, Kensington, Melbourne. See how it looks now Click here. Two children survived her, Charles Henry Prosser of Heatherton and Isabella Luisa Thornton also of Kensington. 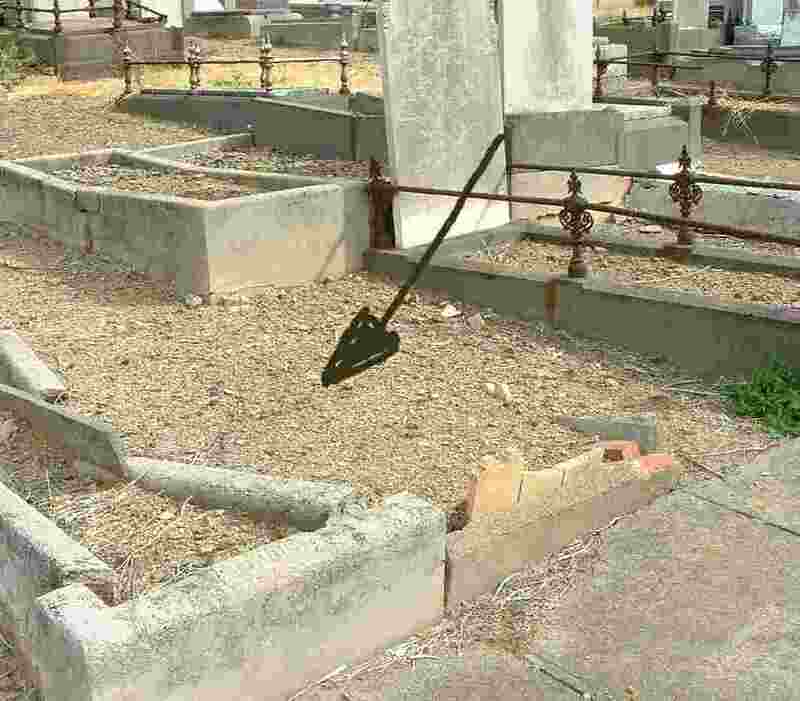 She remains buried in a simply decorated unmarked grave in the Melbourne General Cemetery. Sarah Prosser was one of many immigrants to Victoria at the time of the great gold rushes. She was a true pioneer in every meaning of the word. Born as Sarah Ann Clark in England 23 years earlier, she made her way to the other side of the world in what were the longest and most arduous sea journeys an emigrant could make. The comforts of then bustling Melbourne were not to be home for Sarah, she was to go further a field to the wild and uncertain gold fields of Victoria. Current research would indicate she married a John Prosser many years her senior and had a daughter Ellen (deceased). The marriage took place in Dudley, Staffordshire, England in 1953. She and John migrated to Australia together but soon were separated. The next information for Sarah Ann Clark comes with the birth of her daughter Isabella Louisa Sharman to Charles Sharman in 1857 at Maryborough or Chinaman's Flat gold field to be precise. 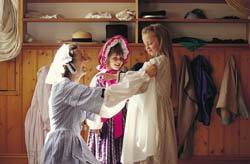 For many women life on the goldfields in the 1850s was very difficult. They often had to live in cramped conditions in small tents with few comforts. Obtaining fresh, clean water was a constant worry. Often fresh water had to be carted to the diggings where it was sold by the bucketful. Cooking a balanced meal was difficult because of the scarcity of fresh fruit and vegetables and prices for goods fluctuated. For most women on the goldfields daily life revolved around the routine of washing, ironing and cooking as well as making candles, butter, jams, bread, soap, mending, and making clothes for the family. Women usually had to face the hardships of childbirth without trained medical assistance. At this time women relied on help from other women or midwives. Infections were common and many women and their children died during childbirth. Despite the hardships facing women on the goldfields their arrival contributed to the end of the disorganized, dirty, tent towns and the beginning of a building boom that turned tent towns into permanent settlements. The area between Maryborough and Timor (4kms north) was known as Chinaman's Flat because of hundreds of Chinese diggers that set up camp and dug for gold in the early 1850s. Within the next 15 years it was the area that employed the most miners. Due to its location and popularity, this area had 38 hotels and many stores large and small and one police station and lockup during the peak period of the 1880s. It was a thriving township. The gold rush to Chinaman's Flat began in October 1856 and after three weeks, about 4,000 diggers were at work. By early February 1857 15,000 were at Chinaman's Flat with up to 2,000 coming weekly. By March, the population had grown to 30,000, in canvas tents and huts of the rudest make. J.M. Barr who wrote of his travels through the gold fields described the Chinaman's Flat Rush as a "hotbed of vice, hocused drink and unchecked orgies, and he talked of women in tawdry finery and besotted men besides their doors". The Argus newspaper reported, "at almost every house of entertainment, there is a gaming table of some sort. It is a subject of regret to see the well-toiled-for earnings of months pass into the hands of certainly not the most immaculate class". There were countless saloons at Chinaman's at this time but it was noted that the "soiled doves" within were not given to pugilism (fighting). Sarah’s partner at this time was a butcher and part time miner Charles Thomas Sharman, from Spalding, England. The birth certificate of daughter Isabella Louisa Sharman to Charles Sharman in 1857, indicates that she was married in Staffordshire, England in 1853 (not recorded) but the later record for Charles Henry Sharman (later to be Prosser) claims a marriage took place in Richmond, Victoria in August 1856 (also not recorded). Generally, husbands did not take their wife with them to the rushes but sent money home. Sarah and Charles were to leave Chinaman's Flat as the gold production declined and miners moved elsewhere. The next event for the family was the birth of Charles Henry Sharman (later to be known as Charles Henry Prosser) in Heathcote in May 1860. The witness to the birth is given to be a Dr Carkeet one of only two doctors present in Heathcote at the time. It is recorded of Dr Carkeet that as he was unable to get on with a Dr Robinson, the other doctor in the town, he had withdrawn from work at the hospital to tend to his patients in the township. He made his daily round to those unable to attend his surgery, not by vehicle but by foot. He lived in a weatherboard cottage in High St opposite the Northumberland Arms Hotel. Apparently, Dr Carkeet came to Australia as Ships Surgeon in the "Countess of Elgin" which reached Melbourne in Jan 1853. Heathcote (McIver) was a fashionable gold rush in early 1853 and reach its peak of about 20,000 in April of that year. As was common with such rushes by June the next year the population had dwindled to 2,000. By Jan 1855, a mere 800 men were working the field. In the late 1850’s attention turned to the reef formations of the district and crushing machines were erected to process the quartz. In contrast to Chinaman’s flat, Heathcote was a disciplined, orderly community, unlike the free for all at Chinaman's Flat. Reference was made to Sarah, Mrs. Sharman donating meat to Heathcote United Methodist Church bazaar in the McIvor Times, Friday Oct 2nd , 1863. Charles returned to Maryborough and worked in High St as a Butcher between 1864 and early 1869. Another rich gold strike occurred in 1865. It is not known if Sarah returned to Maryborough, but it seems unlikely, as Charles was to soon meet and marry another. Charles persisted with his career as a butcher and married Mary Jane Clough WALKER in April 1869. He founded another family that to this day still bears the surname SHARMAN. He soon after moved to the small town of Llanally (Maidentown) another gold mining town. Why did Sarah Ann Sharman nee Clark end her life with her children with the surname Prosser? As current research indicates a marriage prior to leaving England (to John Prosser), maybe Sarah found it easier to revert to her true married name, as she could no longer act as Mrs Sharman, especially as Charles Thomas had married another women. Kensington is a residential and decreasingly industrial suburb 3 km. north-west of Melbourne. It is commonly associated with Flemington, once being in the Flemington and Kensington borough (1882-1906). Its northern boundary is Racecourse Road, the western boundary is Smithfield Road and the Maribyrnong River, the southern boundary is Dynon Road and the eastern boundary is the Moonee Ponds Creek. Kensington contained the Newmarket saleyards and abattoirs, and in its south there are the Dynon Road railway yards and a small area known as Browns Hill east of the railway yards. Kensington has a substantial low-lying alluvial area on which the abattoirs was built. To the east was Seagull Swamp, now J.J. Holland Park. North of the low-lying area is a basaltic layer, defined by an escarpment at the back of the abattoirs and skirting the swamp to Browns Hill at Lloyd and Radcliffe Streets. Healy's Point Hotel below Browns Hill has frequently had its cellar filled with flood water. On 30 August, 1856, a Crown grant was made to the Melbourne City Council for cattle saleyards on the south side of Racecourse Road, Newmarket, and the abattoirs adjoining the saleyard to the south-west. Its most south-westerly boundary conveniently adjoined the Maribyrnong River for the discharge of liquid waste. The buildings were primitive and unhygienic and were replaced by better facilities between 1898 and 1908. Nearby, on the river bank, there were factories for boiling-down, fellmongery, bone manure and glue. In the mid 1870s Kensington included a small area named Balmoral. Future subdivisions yielded street names with a similar regal flavour, somewhat ironical given the proximity of the proletarian slaughter yards. In addition to the riverside industries there were three tanners, a candle maker and a chapel with a school. By then moves were made for a State primary school, and the site in McCracken Street was found and the school opened in 1881. Commercial and residential development clustered around Racecourse Road and down beside the railway line. McConnell Street, McCracken Street and Rankins Road had several shops, but Macaulay Road had only Hardimans Hotel and three shops. The school precinct had Wesleyan and Anglican churches, and later gained the borough hall. Between 1881 and 1890 the State school's enrolment increased from 230 to 700 pupils, and to over 1,000 before the turn of the century. Overcrowding, classes in shelter sheds or pavilions with canvas enclosures, annexes in church halls and the town hall persisted until the 1920s. The peak enrolment was 1,241 in 1913. It had some notable ex-pupils, including Dr. E. Morris Miller and Hal Porter, who lived in a cottage in Bellair Street with smaller dimensions than described in his "Watcher On The Cast Iron Balcony".